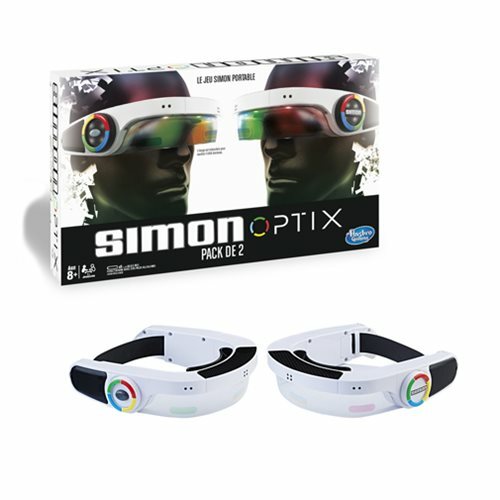 With the Simon Optix game 2-Pack, kids can connect and play with friends. Set the headsets to Sync Mode and get ready to watch, remember, repeat! The innovative Simon Optix game is a wearable electronic game of lights and sounds in which players must repeat random patterns of lights by moving their hands in the correct order. With this 2-pack, each player wears a headset and completes the same sequence simultaneously. Players can also choose to play solo. As the game goes on, the sequences get more challenging. If a player misses a sequence, they're out. The last player standing wins! Includes 2 Simon Optix adjustable headsets and instructions. Requires 8x "AAA" batteries, not included. Ages 8 and up.